Muscadine berries may be bronze or dark purple or black when ripe. However, many wild varieties stay green through maturity. Muscadines have skin sufficiently thick and tough that eating the raw fruit is similar to eating a plum and may be an acquired taste. Muscadines are typically used in making artisan wines, juice, and jelly. They are rich sources of polyphenols. 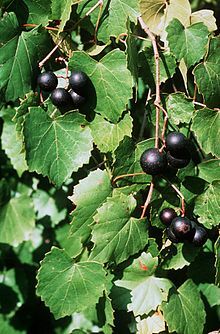 Although in the same genus Vitis with the other grapevine species, muscadines belong to a separate subgenus, Muscadinia (the other grapevine species belong to subgenus Euvitis), and some have suggested giving it standing as a genus of its own. Some taxonomists have also suggested splitting two additional species off from Vitis rotundifolia, Vitis munsoniana and Vitis popenoei. All have 40 chromosomes, rather than 38, are generally not cross-compatible with Euvitis species, and most hybrids between the subgenera are sterile. A few, however, are at least moderately fertile, and have been used in breeding. A commercially available Euvitis x Muscadinia hybrid is the Southern Home cultivar. There are about 152 muscadine cultivars grown in the Southern states. These include bronze, black and red varieties and consist of common grapes and patented grapes. Unlike most cultivated grapevines, many muscadine cultivars are pistillate, requiring a pollenizer to set fruit. A few, however, such as 'Carlos' and 'Noble', are perfect-flowered, produce fruit with their own pollen, and may also pollinate pistillate cultivars. Cultivars include Black Beauty, Carlos, Cowart, Flowers, Fry, Granny Val, Ison, James, Jumbo, Magnolia, Memory (first found on T.S. Memory's farm in 1868 in Whiteville, NC), Mish, Nesbitt, Noble, Scuppernong, Summit, Supreme, and Thomas. 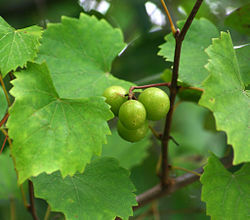 Produced by the University of Florida, the cultivar, 'Southern Home', contains both muscadine and subgenus Vitis in its background. Crops can be started in 3–5 years. Commercial yields of 20–45 tonnes per hectare (8–18 tons per acre) are possible. Muscadines grow best in fertile sandy loam and alluvial soils. They grow wild in well-drained bottom lands that are not subject to extended drought or waterlogging. They are also resistant to pests and diseases, including Pierce's disease, which can destroy other grape species. Muscadine is one of the grape species most resistant to Phylloxera, an insect that can kill roots of grapevines. Consumer research indicates that the thick skins and variable in-season quality of fresh muscadine grapes are significant deterrents to retail acceptance. 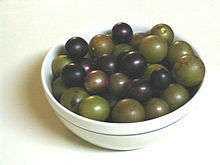 The wild progenitor of the muscadine grape still grows freely in the southeastern United States, such as near Indiantown, South Carolina. As muscadine grapes are notable for their highly pigmented, thick skins in which the content of polyphenols is known to be high, there is active research interest to define these phytochemicals. One report indicated that muscadine grapes contained high concentrations of resveratrol, but subsequent studies have found no or little resveratrol in muscadine grapes. The rank order of total phenolic content among muscadine components was found to be seeds higher than skins higher than leaves higher than pulp. ^ "Vitis rotundifolia". Natural Resources Conservation Service PLANTS Database. USDA. Retrieved 6 August 2015. ^ "Profile for Vitis rotundifolia (muscadine)". PLANTS Database. USDA, NRCS. Retrieved October 18, 2011. ^ Boning, Charles (2006). Florida’s Best Fruiting Plants: Native and Exotic Trees, Shrubs, and Vines. Sarasota, Florida: Pineapple Press, Inc. p. 155. ISBN 1561643726. ^ a b Brown, K; Sims, C; Odabasi, A; Bartoshuk, L; Conner, P; Gray, D (2016). "Consumer Acceptability of Fresh-Market Muscadine Grapes". Journal of Food Science. 81 (11): S2808. doi:10.1111/1750-3841.13522. PMID 27741360. ^ a b c d Pastrana-Bonilla E, Akoh CC, Sellappan S, Krewer G (August 2003). "Phenolic content and antioxidant capacity of muscadine grapes". Journal of Agricultural and Food Chemistry. 51 (18): 5497–503. doi:10.1021/jf030113c. PMID 12926904. ^ Williams, Rick and Tim Baxley. Managing Native Vegetation for Wildlife. University of Florida IFAS Extension. ^ a b "Muscadine Grape Breeding Program: General Information". Muscadine Grape Breeding Program: General Information. University of Georgia College of Agricultural and Environmental Sciences. Archived from the original on 7 September 2015. Retrieved 11 October 2015. ^ a b c Xu, C; Yagiz, Y; Zhao, L; Simonne, A; Lu, J; Marshall, M. R. (2017). "Fruit quality, nutraceutical and antimicrobial properties of 58 muscadine grape varieties (Vitis rotundifolia Michx.) grown in United States". Food Chemistry. 215: 149–56. doi:10.1016/j.foodchem.2016.07.163. PMID 27542461. ^ a b "America's First Grape – The Muscadine". United States Department of Agriculture. November 1997. ^ "Appellations Growing Muscadine Grapes". Appellation America. Retrieved 2007-12-01. ^ Pastrana-Bonilla E, Akoh CC, Sellappan S, Krewer G. "Phenolic content and antioxidant capacity of muscadine grapes". J Agric Food Chem. 2003 Aug 27;51(18):5497-503. PMID 12926904. quote: Contrary to previous results, ellagic acid and not resveratrol was the major phenolic in muscadine grapes. ^ Talcott ST, Lee JH (May 2002). "Ellagic acid and flavonoid antioxidant content of muscadine wine and juice". Journal of Agricultural and Food Chemistry. 50 (11): 3186–92. doi:10.1021/jf011500u. PMID 12009984. ^ Lee JH, Johnson JV, Talcott ST (July 2005). "Identification of ellagic acid conjugates and other polyphenolics in muscadine grapes by HPLC-ESI-MS". Journal of Agricultural and Food Chemistry. 53 (15): 6003–10. doi:10.1021/jf050468r. PMID 16028988. Wikimedia Commons has media related to Vitis rotundifolia. The Muscadine Experience: Adding Value to Enhance Profits 2004 – 80 page technical resource for growers and processors, University of Arkansas.